Girls with perfectly feathered hair, skin tight Sasson jeans and electric blue eye shadow. Giggling and having a grand time, they’d hold court in the lunch room every day. The rest of us nibbled our french fries and Diet Cokes and laughed with our own group of friends. But deep down, we all wished we could belong to the cool crowd. Well tomorrow, I’m heading down south to the Southern Bloggers Conference – in fact, I’m speaking there! I’ll be in a room full of women I’ve never met. Will I be sitting alone, checking my phone and trying to look busy. Donna – Funky Junk Interiors – Don’t put so much weight on ‘what you look like’. Go as yourself, and just BE yourself! THAT is who they want to meet anyway. Read Donna’s post titled “You Should Go” all about getting out of your comfort zone and how rewarding an experience it can really be. She writes, “But you have nothing to fear. Your outfit is perfect because honestly, no one will remember it. They’ll remember your eyes, kindness, voice and warm heart. And you already have that. Brittany – Pretty Handy Girl – My #1 piece of advice is to go up to someone else who looks like they are all alone and too shy to introduce themselves and say “Hi, I’m Kelly with Eclectically Vintage”. Heather – At the Picket Fence – Even though it’s so much fun to see your close bloggy friends, take the time to reach out to new people and get to know them. Expand your horizons. Keep a smile on your face and be approchable. Because we did this at Haven we met other bloggers that are now truly dear friends! Get out of your comfort zone and introduce yourselves to vendors and brands that are there, you never know when you’ll make a great contact for future collaborations. Kari – Thistlewood Farm – So important to remember that everyone is feeling just like you! Sometimes all it takes is a friendly word and a smile to make a new friend! Lisa – The Pennington Point – I take great music to listen to on the ride there (in this case, the flight) and praise music and it always gets me in the mood and helps me remember who I am and what’s really important. By the time I arrive, I’m ready to be myself! Rhoda – Southern Hospitality – My #1 advice is just what’s already been mentioned. Get out of your comfort zone, meet new folks and be yourself. You’ll realize that we are all alike and have lots of commonalities among us. We’re all just folks! Shannon – Fox Hollow Cottage – Just be you, relax and have fun! Janel – Nellie Bellie – Have Janel go with you to be your wing woman. It’s that easy. No really…be yourself. That’s it. Sharon – Mrs. Hines Class – A warm smile such as yours will invite people to approach you. I also suggest approaching others and introducing yourself. Make no assumptions and just be yourself. Ann Marie –White House, Black Shutters – Be yourself, don’t be shy and clam up. Reach out to people, spark up conversations, say hi! If there is an opportunity to ask a question in a session, ask away! Beth – Unskinny Boppy – Hang out at the bar late at night with wineglass in hand. (does this gal eerily know me or what)? Debbie – Debbiedoo’s – My guest room is always open for y’all! We could cook up some pizza’s and crack open a bottle of home made vino:). Hmmm, seems they are encouraging me to be myself – obviously they don’t know me very well! but maybe I should pack Sasson jeans and blue eye shadow just in case. 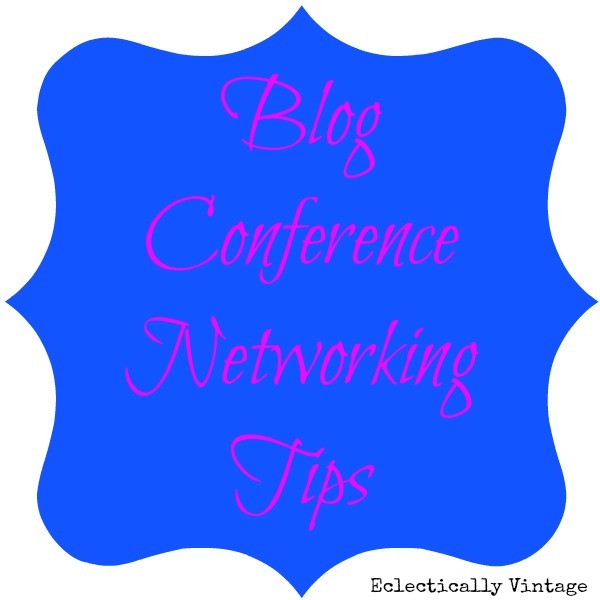 Follow me on Twitter (@kellyiseclectic) and Instagram (Eclectically Vintage) to get my behind the scenes look at a blog conference. Wish me luck on my 8 hour drive to Raleigh NC! Look for me, I will be the one with my Sasson jeans on with bonnie bell lip smacker in my pocket! don’t walk by me and act like you were never that cool! Good luck Kelly! Wish I could hear you speak. I know you will be great! I’m sure you’ll rock it out and have a great time, too! Wish I could be there — I’ll look forward to all the scoop when you get back! Lots of great advice there, I’m sure you’ll do fine! Have a blast and enjoy meeting lots of people. “Heathers” marathon viewing in my room. Now, that’s the ultimate cool table movie! Start spreading the news….I’m leaving today 🙂 See you soon my funny friend! I cannot WAIT to meet you! You will be awesome! Wish I were going! Can’t wait to hear all about it! I agree… if you really want to get noticed cake on the blue eyeshadow. 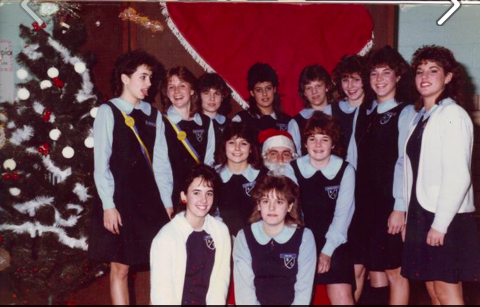 Are you the girl sticking your tongue out? The disadvantage of not having a blog is you don’t get to go to these meetings. The advantage is I get to read about everyone else going. Have a wonderful time and smile at that girl over in the corner, if I were there it would be me. awhhhh how fun!!! I wish I could go and share a bottle of wine with you! I love the advice and I will be trying to remember it for SNAP!!! :o) I know you are going to have so much fun and for sure be one of the popular kids, I just don’t see how you wouldn’t be haha! oooh, what fun! But I get the stress too! All great advice though – easier said than done! ha! Just kidding – you will be fine, perfect in your own little way, I’m pretty sure you’ll have a blast. Can’t wait to see what happens over there! Enjoy! It will be great, “wine” seems to be the dominate theme 🙂 Enjoy. Have a wonderful time! I’ll make a toast to you from my living room. No pressure- but we’re so excited to hear you speak! Hope to get a chance to meet this weekend! You will be amazing there. Huge congratulations on your speaking engagement!! I love Donna’s advice, she is such a wise sage. Too funny, the comment about the “popular table”. It still exists in 2012 in the Cafeterias of High School. I know because my daughter has a friend who splits her time between the popular table, and my daughter’s table. Keeping a toe hold in the old, familiar, and friendly crowd, just in case you get voted off the popular table island. It’s kinda like I stalk you, huh? You are going to be just fine! In fact, you’re going to be more than fine. Haven was THE BEST thing I’ve ever done, and if this one is half as much fun it will be awesome! I’m so jealous you get to hang out with Kari and Heather and everyone else who is going!! Is Debbie (refresh restyle) going? She is so, so sweet! Loved her too. Yes – I met Debbie today!! She’s fabulous – wish you were here! I’ll toast you with a glass of vino! I’ve never been the popular girl but I had rockin’ Calvin Klein jeans back in the day. I so wish I had kept them…anyway, I’m obviously not at the conference. It’s killing me to watch and hear about all the fun y’all are having. There was a lot of talk about comfort zones in this post. Well mine has one of those supernatural hard-to-see-through walls that I sometimes just can’t break down. I’m terrified of traveling by myself and honestly I’m not sure I can do it. But I’ll work on it and you never know. Maybe I can come to Haven. Maybe. Safe travels coming home Kelly!